When you buy hardwood flooring in Savannah, GA or the Low Country make sure your installer is thinking about how heat and moisture will affect your floor. Flooring can make or break your decor. It's not always what hits you when you walk into a room, but it can certainly ruin the ambiance if it's done wrong or make a room glow if its done right. Unlike a lot of other home decor, flooring is an important functional element of your home in addition to the beauty and comfort it can add. There are hidden costs you need to be aware of and pitfalls that can wind up costing you more money if you're not fortunate enough to have a flooring expert to walk you through the entire process. Savannah is a hot and humid climate. This can have a huge impact when you are laying down flooring . Here are three things you must take into consideration when choosing and buying your floor. Too much moisture in the cement beneath hardwood flooring can ruin the floor if the floor is not installed just right. Savannah soil is wet from all of the rain and humidity in our climate. This moisture will rise up through your home's foundation and ruin your floor if it is not installed with the right care and especially the right adhesive. Which brings us to point #2. The adhesive that binds the hardwood to the sub-floor must match the humidity requirements of the home's foundation. 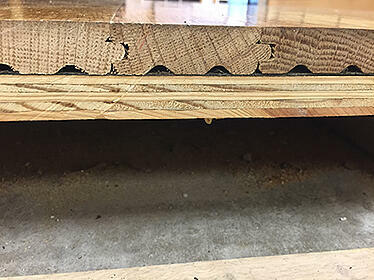 Adhesive for wood flooring in Savannah that is not matched to the humidity requirements of our humid climate will cost you a lot more in the long run. It is not unusual for a sub-floor to need be correctd so that floor boards will lie perfectly flat. Carpeting can hide these imperfections, but when it's time to install wood flooring, those imperfections can be ruinous. It can cause buckles, squeaks, breaks and make your new floor impossible to clean. So be aware that a good hardwood installation will often include a need for corrections to the sub-floor. For more about replacing carpeting with hardwood check out this article: Replacing Carpeting with Hardwood. You invest in your floor because it makes your home more beautiful and more comfortable. Protect your investment by making sure that you have the right adhesive and preperations for the humidity that affects flooring in Savannah.